PL Myers had been running HeroTV on Comcast for the last 20 years. He asked me to join as co-host for his 21st year in 2017. Of course, I jumped on board. Our first show was an introduction of the revised show including me. Our second and third show featured us interviewing Elliott Serrano, the King of Chicago Geeks. The fourth show starts today and I am so proud of this episode. 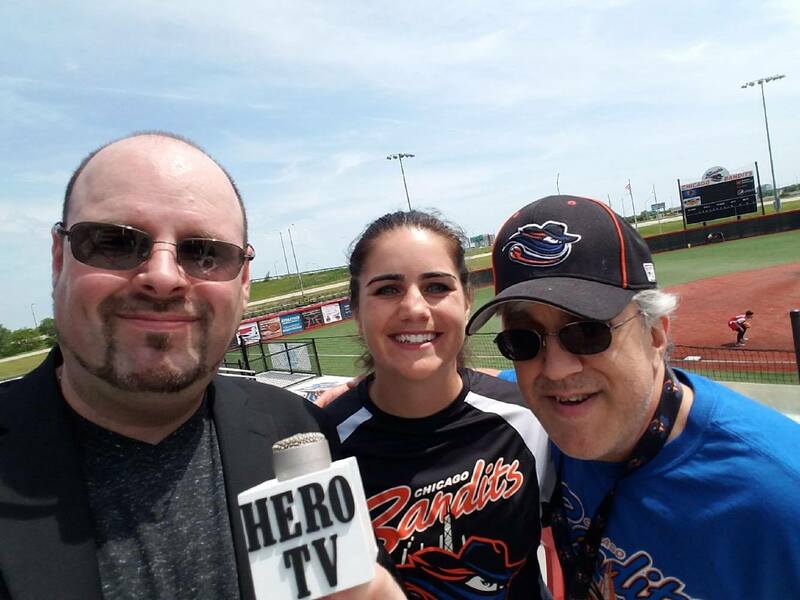 It was our first real on-location show and I organized it, including getting our guest, Emily Allard of the Chicago Bandits. As regular readers know, I cover the Bandits and I love the Bandits and National Pro Fastpitch. Emily is one of a handful of players who have been there for all of my four seasons. Actually, she was a rookie in my "rookie" season with the team. I just love Emily. She's everything you'd want in a player, teammate, coach, friend or person. She's tough, athletic, intelligent, funny and sweet as can be. She always has had time for our interviews at the ballpark or even just friendly chatter. This time, the interview wasn't for Johngy's Beat, but rather for HeroTV. despite being her usual busy self, Emily gave us her time on a beautiful Sunday morning at the ballpark. PL and I asked several questions and Emily gave us thoughtful answers. I really enjoyed this experience. As we stood there in the park, I knew this was why I loved doing this. It was a perfect morning and we got to air Emily's story and promote the Bandits a bit. That episode started airing July 1 on Comcast and it will be on our HeroTV YouTube channel soon. I am excited to see it air and I hope you all enjoy it. On an unfortunate side note, since the taping, Emily has had to step away from softball for now due to injuries. Her softball future is uncertain, but I know if she can come back, she will. If she cannot return, she will be involved in some way and she will continue making the world a better place. Thank you to PL for this opportunity. Thank you all for following me and hopefully you will watch this episode. Finally and most importantly, a HUGE thanks to Emily for her time and consideration. Thanks, too, to Emily for doing what she does and making a difference. It has been a pleasure knowing Emily and a thrill to interview her in this format. As always, thank you to the Chicago Bandits for letting me do what Iove doing. Check out the team at ChicagoBandits.com. PL Myers, Emily Allard and me in Rosemont, IL-June 2017.